While the overall research is inconclusive, evidence shows the polyphenols in tea, particularly catechins, have biological activities that may be relevant to cancer prevention. Catechins are highest in concentration in white tea and green tea, while black tea has substantially fewer due to its oxidative preparation. These antioxidants have also been shown to inhibit tumor growth: green teas specifically have been shown to activate detoxification enzymes that may help protect against tumor development. But don’t rely solely on tea to keep a healthy body — tea is not a miracle cure, after all. Unwanted blood clots formed from cholesterol and blood platelets cause heart attack and stroke. Drinking tea may help keep your arteries smooth and clog-free, the same way a drain keeps your bathroom pipes clear. According to a study conducted in the Netherlands and published in the Archives of Internal Medicine, drinking tea was associated with a more than 50 percent reduction in severe atherosclerosis (hardening and narrowing of the arteries) in women who drank 1 to 2 cups a day. Another study, published in the journal Stroke, found that long-term consumption of black, green, oolong or white tea can cut the risk of strokes by as much as 60 percent. All tea leaves contain a small amount of natural fluoride; however, mature leaves contain as much as 10 to 20 times the fluoride levels of young leaves from the same plant. Fluoride is a chemical that can help prevent tooth decay. Additionally, fluoride works to repair teeth in the early stages of tooth decay. Studies have also found tea polyphenols inhibit the growth of bacteria in the mouth, thus minimizing the foul-smelling compounds that those bacteria produce. So add unsweetened tea drinking to your daily dental routine of brushing and flossing for healthier teeth and gums. Tea might be an effective agent in the prevention and treatment of neurological diseases, especially degenerative diseases (think Alzheimer’s). While many factors influence brain health, polyphenols in green tea may help maintain the parts of the brain that regulate learning and memory. It may also inhibit senile plaques from depositing in the brain, which impairs cognition. Overall, one to two cups of green tea a day may boost your learning and memory. Green tea has been found to improve bone mineral density and strength. One study that compared tea drinkers with non-drinkers, found that people who drank tea for 10 or more years had the strongest bones, even after adjusting for age, body weight, exercise, smoking and other risk factors. Researchers also say that these results confirm previous studies that have suggested drinking tea may protect against bone loss and osteoporosis. Tea doesn’t have any calories, unless you add sweetener or milk. If you’re looking for a satisfying, calorie-free beverage, tea is a top choice. 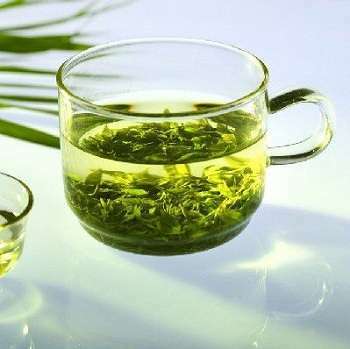 In addition, catechins (antioxidants) in green tea extract may trigger weight loss by stimulating the body to burn calories and decreasing body fat, especially in the abdominal (belly) area. To get green tea extracts, opt for the real deal — boiling water with a good old-fashioned teabag or loose tea! Green tea has also been shown to actually increase metabolic rate so that you can burn 70 to 80 additional calories by drinking just five cups of green tea per day.